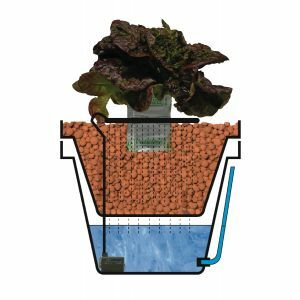 The GHE WaterFarm System is a great little self contained Hydroponic System. It comprises of two pots one of which sits inside the other and leaves a 10 litre reservoir in the bottom. The WaterFarm System is a great little self contained Hydroponic System. It comprises of two pots one of which sits inside the other and leaves a 10 litre reservoir in the bottom. A simple air pump is used to circulate the nutrient back to a ring of pipe around the top of the pot. The Pot is filled with Clay Pebbles or similar like perlite. The System can be used for up to 6 smaller plants or 1 large one. It is ideal for mother plants as it can be moved about so easily and the nutrients can be changed on a regular basis without causing to much trouble. The waterfarm is a simple qaulity ststem that is great for longer term plants and trees. The aquafarm hydroponic system is a larger version of the waterfarm, The 4 unit controler which can be extended to an 8 unit system is ideal for both farms and will automatically top up the reservoir. A controller is available and can control 4 units with additional kit up to 8 units can be run from the one controller. Great Results & a great piece of kit that has been very popular for the past 10 years!